A couple of months ago, I was asked by some friends whether I wanted to see Axis of Awesome with them. “Who?” I asked, handing over my ticket money in the belief that I could trust said friend’s taste. Axis of Awesome are an Australian (yes, let’s get that out there right now – never let it be said I am unsupportive of my native countrymen) comedy band who, unbeknownst to me, are something of a Youtube sensation. They specialise in the ridiculous and this tour brings their silly songs (their words not mine) and Aussie banter to the stage across Europe. Well Germany, The Netherlands, Ireland and the UK anyway. It’s a blend of cleverness and irreverence that had the audience, including moi, rolling in the aisles. I wanted to capture the hilarity provoked by the show for you but it was hard to choose one thing – there was Bird Plane, How To Write A Love Song and Can You Hear The ****** Music Comin’ Out Of My Car – but the one that has made them stars the world over, thanks to the wonders of Youtube, is the 4 Chords Song. They have re-released this with new songs added which was featured in Thursday night’s show so you can click here if you want to see their latest video. These are some funny, funny dudes so if you enjoy a good belly laugh, you should get along to see them while they’re touring Europe (OK Germany, Holland, Ireland and UK) or catch them when they get back to Oz. 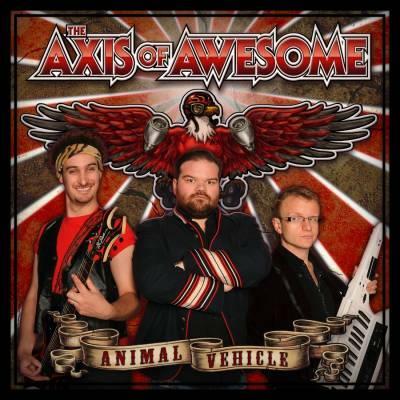 You can find show dates by going to their official website www.axisofawesome.net or by clicking here. In the immortal words of Ian ‘Molly’ Meldrum (the Australians reading this will get this reference), do yourself a favour! This entry was posted in laugh out loud, The Australian Way and tagged 4 Chords Song, Axis of Awesome, Molly Meldrum, music by Kym Hamer. Bookmark the permalink. Thanks HHUK I've heard some good things about Rock of Ages so it's on the list now! Aaaah we don't do Thanksgiving in Australia Linda so I completely missed this clash. I've started following AoA on Facebook and Twitter to get a heads up on any new stuff they do. Now I've discovered them, I don't want to miss a thing! Jack, I'm glad this has inspired you. My work here is done. I was thinking how fun it would be to see a show like this that someone else has recommended, so I checked out the tour date for Amsterdam. Imagine my disappointment when it was this Thursday, American Thanksgiving?? Such a bummer, but that is a huge holiday for us and since Husband doesn't have the day off, we'll be doing the poverbial feast that evening. Sigh… but thanks for the heads up. Absolutely brilliant. I feel I need to use this somehow!